A natural spectacle like no other is performed every day in Paracas. A few kilometers from the coast lie the Ballestas Islands, an ecological sanctuary with an astounding diversity in marine life; whereas across the bay, stretch seemingly endless kilometers of sand dunes, perfect for adventure lovers, and just a short flight away are the enigmatic Nazca Lines, declared a World Heritage Site in 1994. The Ballestas Islands are a half hour from the coast of Paracas and one hour from the city of Ica. They are home to a diverse and unique coastal wildlife mainly consisting of sea lions and sea birds as well as some Humboldt penguins and sea otters. On the way out to the islands, you are treated to a perfect view the Candelabra, a huge, mysterious geoglyph etched in the sand on the coast of Ica. 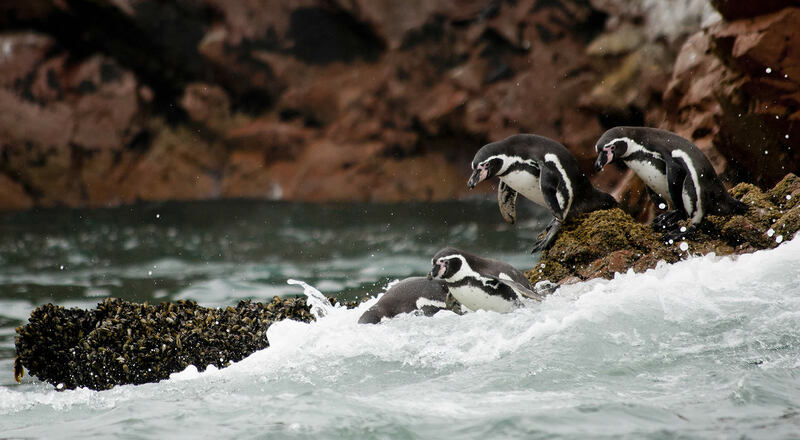 The Ballestas Islands are the most visited in Peru for their majestic marine ecosystem and iconic rocky landscapes. The 335 000 hectare Paracas Nature Reserve is considered by many to be Peru’s best marine reserve because of its diverse and enchanting marine environment. It is the perfect place for those who would enjoy spending the day exploring her rugged desert coast or marveling at her wild inhabitants. It is more than a simple natural paradise, however, abounding with archaeological sites belonging to the ancient Paracas culture whose principal remaining monuments are the necropolis, the archaeological sites of the Cabeza Larga (Long Heads) and the Pampa de Santo Domingo. The best time to visit is between January and March. 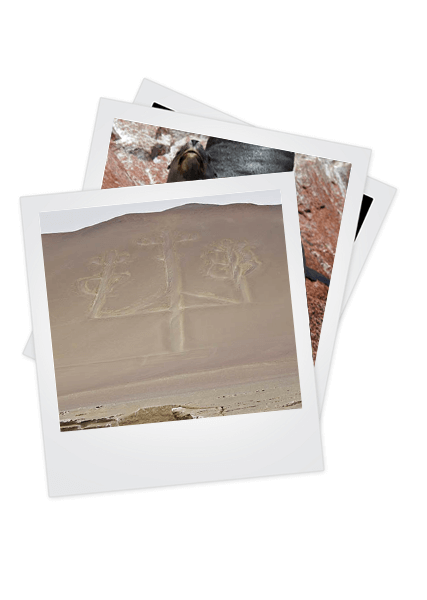 The Nazca Lines are one of Peru’s greatest mysteries, an enigma that to this day resists enquiry and interpretation. The lines, best seen from the air, are patterns etched into the sand by an ancient Nazca culture, depicting immense symbols, some almost 300 meters long. The designs range from simple lines to complex zoomorphic figures, representing more than 30 animals such as the monkey, the spider and the hummingbird, among others. They were included in the World Heritage List of UNESCO in 1994. A flight over the lines usually takes 1 hour 40 min and maintains an average height of 1500 feet. Considered one of the driest deserts in the world, Paracas is a place full of history, culture and amazing landscapes. Your tour of the Paracas desert dunes will be an unforgettable experience, especially if you live this experience under a starry sky where you and nature are the only protagonists. Tambo Colorado is one of the archaeological monuments with the best-preserved adobe ruins in Peru. Despite not being roofed, there are a number of walls with recesses painted red, yellow and white. This Inca administrative center is strategically located in the middle of a gorge in the Pisco River and was one of the most important centers established by the Incas on the Peruvian coast.